Charlotte, nicknamed the “Queen City”, is home to over 700,000 people and is the second largest financial city by assets only behind New York City. Charlotte is a microcosm of culture and finance creating a market where both local advertisers targeting specific audiences as well as large billboard campaigns can be successful. Outdoor advertising can be used near frequently visited museums like Bechtler Museum of Modern Art and the Billy Graham Library. Some notable performing art venues are the Actors Theatre of Charlotte and Carolina Actors Studio Theatre, where more advertising techniques can be used. 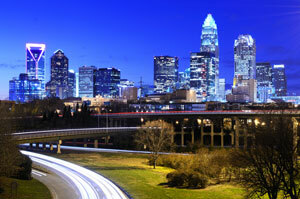 Two major highways connect in Charlotte making it a freeway and transportation hub. Billboards on I-85 or I-77 would yield high traffic exposure for your business. Zip Codes: 28201, 28202, 28203, 28204, 28205, 28206, 28207, 28208, 28209, 28210, 28211, 28212, 28213, 28214, 28215, 28216, 28217, 28218, 28219, 28220, 28221, 28222, 28223, 28224, 28225, 28226, 28227, 28228, 28229, 28230, 28231, 28232, 28233, 28234, 28235, 28236, 28237, 28240, 28241, 28242, 28243, 28244, 28246, 28247, 28250, 28253, 28254, 28255, 28256, 28258, 28260, 28261, 28262, 28265, 28266, 28269, 28270, 28272, 28273, 28274, 28275, 28277, 28278, 28280, 28281, 28282, 28283, 28284, 28285, 28286, 28287, 28288, 28289, 28290, 28296, 28297, 28299.